Located in one of the most desirable neighborhoods in Snowmass Village, this luxury ski-in/ski-out villa has everything a family desires. 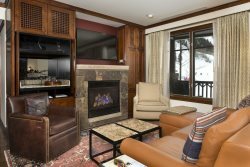 With easy ski-in and ski-out access to the Two Creeks ski run, it's one of the most convenient locations on the mountain. Almost 5,000 square feet of living space delivers a spacious setting to enjoy even an extended family retreat. Sit on the deck in any season and soak up the sun right outside your living room. Guests of "The Roxie" love to gaze at the amazing mountain views or soak in the private outdoor hot tub after a long day on the mountain. Some of the amenities include a built in BBQ, vaulted ceilings, bedroom suites with ensuite bathrooms, a living room with 56” HDTV, new hardwood flooring and complimentary wireless high-speed internet access. "The Roxie" at Snowmass Village combines traditional log architecture with very high-end finishes that combines a rustic and inviting feeling. Tall ceilings and full-height windows in the great room make the most of the mountain views, while a rock fireplace, luxury sofa and outside views welcome the entire family.